Wilderness Wars is a brilliant adventure story for children. It’s aimed at young readers aged roughly 8-12 but of course this will vary depending on the skill of the reader. I thoroughly enjoyed reading this book. A story about a family moving to live on a remote Scottish island narrated by a twelve year old girl is going to be exciting enough but there is so much more going on in this book. Right from the beginning, Em, her family and the others living on the island have all kinds of challenges thrown at them with wild weather, natural disasters and the island’s wildlife seemingly working against them. Almost every chapter has some form of danger and drama in it and most end on mini cliffhangers. If it was a book you were reading aloud to a child, they would be absolutely begging for ‘just one more chapter’! With lots of environmental issues to think about, plenty action and children working together to avert potential disaster, young readers are going to love this thrilling book – I know I did! I noticed with my second book, Punch: kids in any audience would immediately sit up and listen as soon as I tell them it includes a murder story. Young eyes ignite with interest and inexplicably, excitement mounts. 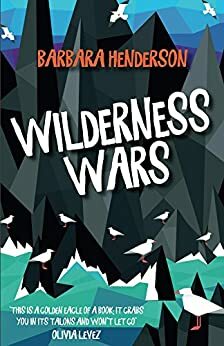 Wilderness Wars goes one better – not one murder victim as in Punch, no – there is danger of a whole community wiped out: adults and children. As in all the best children’s books (my favourite ones, anyway), everything depends on the child protagonist who is far from a disengaged bystander. It is in the power of the child to avert disaster, by making the brave rather than the easy choices. Maybe this is the reason why Wilderness Wars has held such a special place in my writer’s heart since I wrote it in 2013: There is excitement because the stakes are high. Really high. Of course it doesn’t begin like that – but there is a sense of menace from the beginning, a dark foreboding of things yet to come. My imagination wasn’t caged by what was possible: if you accept the outrageous assumption that the whole of the wilderness can declare war on a project, on a community as it does in Wilderness Wars, then the readers have suspended their disbelief already. You have free rein: Let rip, Barbara. Go for it. If nature fights back, what’s in your head? It didn’t take me long. This book was a gift to exercise the creative muscles: Let’s have crashing trees and rogue waves and freak weather and squalls. Let’s throw in a gull attack (I’ve been divebombed by gulls before, and believe me, it’s flipping terrifying!). Let’s throw in an eagle because I LOVE eagles. And we had to have rodents because they can attack from within. You can probably guess that I’ve been on the receiving end of that too. And what’s the worst, the most dramatic that nature could throw at you: Landslide? Earthquake? Tidal Wave? Yep, I’ll have ‘em all. Now, danger and drama in Middle Grade fiction is a fine line to tread. I personally subscribe to the school of thought that you can never have enough jeopardy, really, but you have to be careful: Cruelty to animals is distressing for young readers, and they do identify with your characters to an extent that it is important – imperative – to leave a sense of hope. I hope that, despite the real life and death scenario, young people will be fascinated, mesmerised, but not traumatised. That’s the challenge. I wait for the verdict. And no-one is going to spare me that drama. Thanks Barbara – from praise I’ve seen so far, I’m sure the verdict will be positive! to the launch of Wilderness Wars. I LOVED this book and can’t wait to share my review! A real page-turner. I’m passing it on to my wee nieces now. I’m saving mine for my great nephew when he’s old enough to read it!